In mid February, we completed a 42″ x 36″ tap on 42″ PCCP at the Marlborough Easterly WWTP. 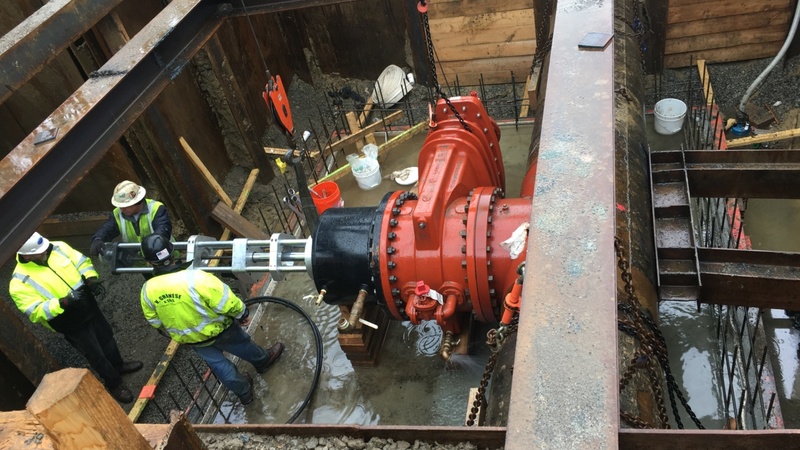 During the week before the blizzard of 2013, we were able to install the tapping sleeve and mount the tapping valve and the general contractor, Methuen Construction was able to complete the two concrete thrust block pours hours before the snow started. The 5 pictures show the mounting of the inner gland with a close-up of the actual unreinforced steel cylinder after the prestress wires had been cut as well as one of Ed tapping, the closed 36″ valve after tapping and the cutter with the intact coupon. The tapping valve was a 36″ AFC vertical one with gearing. 452 turns to open and close. Just another day in Paradise! But I would like to add that for large diameter tapping valves, AFC is my personal favorite. This was the first time we had worked for Methuen Construction. It was a wonderful experience. Our excavation was perfect, which makes all the difference since these type of taps entail days of work in the hole with the installation of the sleeve and valve. The actual tap is usually anti-climactic. Which is exactly how we like it!! Click on a photograph for a larger view, then scroll through the gallery.